A string of early missteps, from explaining policy to cleaning up statements, raises questions about the candidate’s long-term prospects. MILWAUKEE — A more disciplined candidate might not have been so sloppy, with months to prepare and adoring crowds waiting. Yet there was Beto O’Rourke, wobbling on policy, offending women with a joke about child care, frustrating local Democrats with his high-handedness and picking bewildering fights with the press. 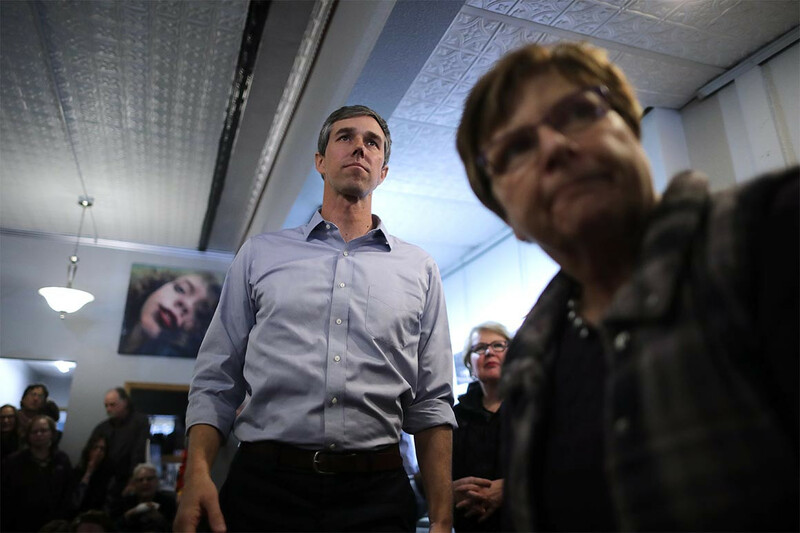 Four days into his presidential campaign, O’Rourke’s supporters are still stuffing themselves into coffee shops and living rooms across the Midwest to see the Democratic sensation as he motors east from Iowa to New Hampshire in a Dodge Grand Caravan. And O’Rourke by the weekend was moving deliberately to speak more specifically about policy, to hold more organized events and to mend his relationship with the media. But for all the charisma and fundraising that could carry him far into the Democratic primary, a series of missteps in his campaign’s earliest days served as a reminder of how uncertain a prospect his star remains. O’Rourke’s liabilities began showing soon after he arrived in Iowa, the first-in-the-nation caucus state. On Friday, the second day of his campaign, the former Texas congressman was forced to apologize for what he called “really hateful” writings from his youth, after a fictional post he wrote as a teenager about murdering children surfaced. It was not a clean start to O’Rourke’s 2020 run. Though he benefited from nonstop media coverage and his own political acuity — thrilling crowds by addressing them from café countertops and delivering a passionate, widely viewed response to the mass shooting in New Zealand last week — O’Rourke’s opening act also laid bare disorder in his campaign. On the eve of his campaign announcement, O’Rourke personally apologized to a prominent Democrat in Iowa for his campaign’s lack of organization there, attributing it to late decision-making and a skeletal staff, according to a source familiar with the conversation. Hosts of multiple events in Iowa said they were informed unusually late about logistics, especially given the large crowd sizes O’Rourke could command. And with O’Rourke’s small staff focused intently on Iowa, Democratic activists in at least two other states, including New Hampshire, said calls they were told to expect from the campaign never came. Operational shortcomings are not uncommon in early presidential campaigns and can be overcome. Norm Sterzenbach, a former executive director of the Iowa Democratic Party and a highly respected strategist in Iowa, is helping O’Rourke in the state. An advance staff is already in place. But then there was the matter of the candidate himself. After announcing his candidacy last week, O’Rourke put up a new website featuring a product store with “Beto” hats and tote bags for sale. But there was no information about his positions on issues, and when he arrived in the Midwest, he faced persistent criticism that on policy he lacked clear ideas. Multiple times in Iowa, O’Rourke answered questions about policy proposals by addressing what he called “the spirit” of the question. Human trafficking? O’Rourke mentioned the importance of funding for training and law enforcement, but he said, “I want to make sure that we listen to the local communities as they show us” how to address the issue. O’Rourke said that he had no plans to hold high-dollar fundraisers but that he would not rule them out. “I think this conversation should certainly happen,” he said. Even when it came to what separates him from other candidates, he demurred. Before an appearance by O’Rourke in Henry County, Iowa, Jeff Fager, chairman of the county Democratic Party, said he wasn’t sure what to make of O’Rourke’s answers. O’Rourke maintained he had “given very specific answers” on questions about immigration and criminal justice reform, among other issues. He supports legalizing marijuana, abortion rights and a $15 hourly minimum wage within six years. His progressive views on immigration remain unchanged. By the time he arrived in Madison, Wis., on Sunday for the continuation of his tour, O’Rourke was beginning to point more forcefully to specific legislation he supported, including around campaign finance, Social Security and gun control. Several hundred people cheered him at a coffee shop and in the spillover on the sidewalk in the college town. And the media was there to see the exchange — after O’Rourke infuriated network and print reporters at the start of the campaign. His staff initially refused to provide basic information to many outlets about events, and they told some reporters that events were closed to the press — or forced them to leave — while allowing others in. The campaign left a crush of press in the dark even about O’Rourke’s first stop in Iowa — the first public appearance of his campaign. On Friday, O’Rourke said of his media relations strategy that he had been “pretty open and pretty available,” after refusing moments earlier to answer a question about reparations for black Americans. Nor did he respond to a question about his operation’s similarities to President Donald Trump’s widely criticized practice of excluding reporters from certain events. The next day, O’Rourke answered several minutes of questions from reporters in Madison. He then left for Milwaukee, where he held the first scheduled — not impromptu — availability of the campaign. He took questions on everything from climate change to the Republican Party’s latest attacks on him to how he manages parenting from the road. The campaign provided basic logistical information to reporters. And even when he declined to answer a question — refusing to say how much money he has raised — he did so with a newfound lightheartedness as the campaign begins to hit a smoother stride. “I’m sorry that I can’t give you,” he said, before stopping himself, acknowledging a previous exchange with reporters in which he had been told he could disclose how much money he had raised, but was electing not to.